Hideo Gosha's film debut, Three Outlaw Samurai (based on an earlier TV show of the same name that Gosha worked on), is a lean, thrilling genre picture. Gosha draws his details sparely, working with archetypal characters and familiar samurai notions of honor and bravery to deliver a brisk 93-minute entertainment, unfettered by extraneous particulars. But though its setting and character types are common, Three Outlaw Samurai's chief pleasures come not from the comfort of the familiar but from Gosha's bracing visuals and inventive direction. Weaving an abundance of technically superb swordfighting scenes with a tale of class warfare and bureaucratic inertia, Three Outlaw Samurai opens with wandering ronin Sakon Shiba (Tetsuro Tamba) happening upon a kidnapping. Three peasants have captured the local magistrate's daughter (Miyuki Kuwano) in an attempt to secure better living conditions for themselves, and Shiba comes around to their plan, acting as the lone wise warrior in a sea of desperate incompetence. The corrupt magistrate (Tatsuya Ishiguro) sends out bands of his own samurai to overtake the peasants and reclaim his daughter, but there are some defections — the jovial Kyojuro Sakura (Isamu Nagato) and the skeptical Einosuke Kikyo (Mikijiro Hira) join Shiba to defend the peasants' cause. But their own personal honor proves to be an uneven match for the magistrate's underhanded ways, leading to a series of violent confrontations. The unexpected actions of the three titular samurai set them up in direct opposition to the rigidly defined feudal roles that are deeply entrenched here. The rich live in luxury while the working class suffers, and Gosha is constantly reminding us of this status quo with his richly detailed compositions, frequently framed by doorways, crossbeams and constricting right angles. His action sequences have a tendency to disrupt this visual order — canted frames tilt the proceedings into a frenetic, violent attempt at correcting the injustice. Some of Gosha's most interesting shots in the film see him zeroing in on a specific face and holding the image there while something violent occurs — often to that shot's subject — just outside of the frame. There's an unpredictable energy to the film's violent encounters that makes the film seethe. Three Outlaw Samurai was an auspicious debut for Gosha, proving that he could transition into the world of TV to film with a flair for expertly constructed action and compelling composition. 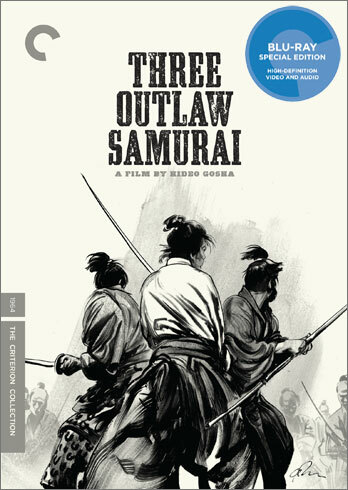 Criterion's 1080p, 2.35:1 transfer of Three Outlaw Samurai is simply gorgeous, displaying breathtaking amounts of fine detail in everything from clothing fibers to foliage. The image is consistently sharp, with healthy amounts of film-like grain and excellent grayscale separation. The transfer's very few stray marks are almost totally negligible, leaving us with a clean, beautiful black-and-white presentation. Audio is presented in an uncompressed monaural track that gets the job, with adequate clarity for voices and effects. A release even sparer than the film itself, the disc only includes the film's theatrical trailer as an extra. The package also contains a booklet with an essay by the very fine critic Bilge Ebiri, and his overview of Gosha's career, the transition from TV to film and themes of disloyalty in Three Outlaw Samurai is a great read. Very thin extras for Criterion these days, but the lower price point releases are still meticulously produced, as the beautiful transfer here can attest to.